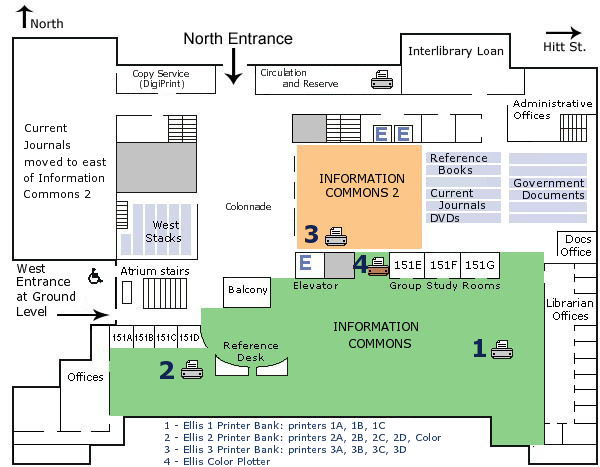 Printing for a fee is available on public workstations at Ellis Library. Print jobs may be picked up and paid for ($0.05 per page) at the Circulation Desk. Non-MU patrons cannot print in most branch libraries. 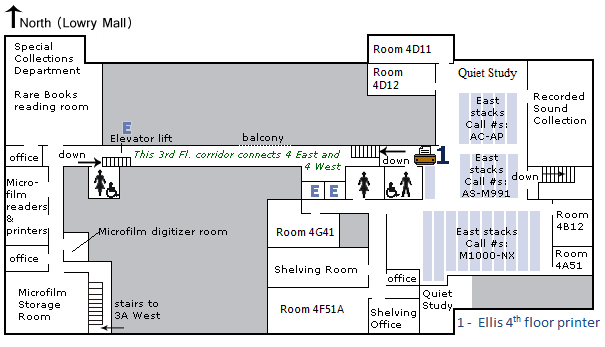 As of June 1, 2018, DoIT moved the Plotter Printer/Poster Printer(#4 in map below) to Copy Services (DigiPrint) located by the north entrance of Ellis Library. For more information on the PrintSmart system see the DoIT PrintSmart information page. If you encounter printing problems when there are no staff at the Reference Desk, call the Division of Information Technology Help Desk at 882-5000.